Gomal University Dera Ismail Khan Khyber Pakhtunkhwa. 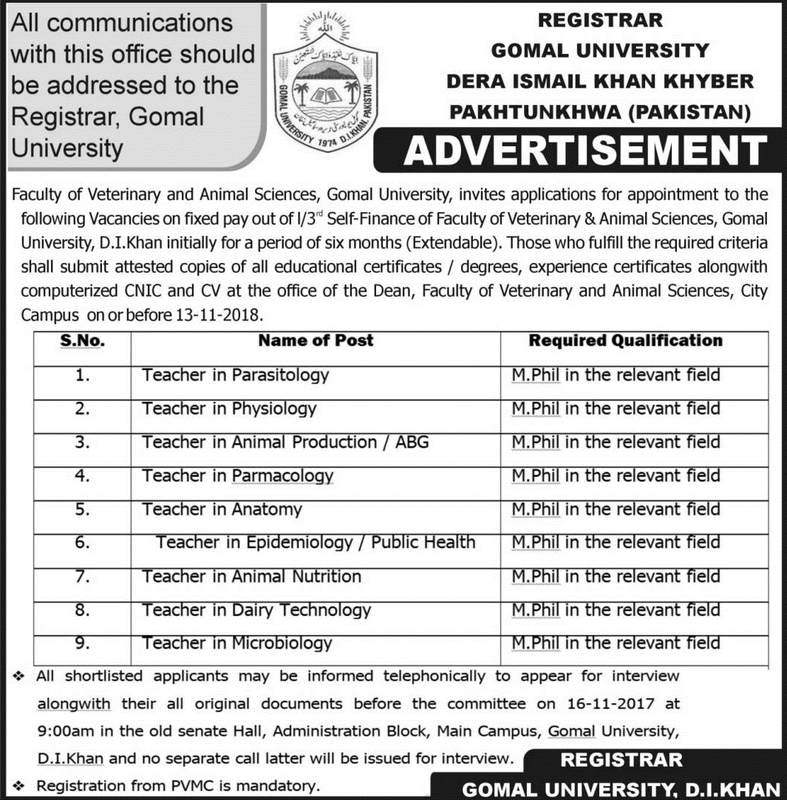 Faculty of Veterinary and Animal Sciences, Gomal University, invites applications for appointment to the following Vacancies on a fixed payout of 1/3rd Self-Finance of Faculty of Veterinary & Animal Sciences, Gomal University, D.I Khan initially for a period of six months (Extendable). Those who fulfil the required criteria shall submit attested copies of all educational certificates/degrees, experience certificates along with computerized CNIC and CV at the office of the Dean, Faculty of Veterinary and Animal Sciences, City Campus on or before 13-11-2018. Required Qualification: M.Phil in the relevant field. ❖ All shortlisted applicants may be informed telephonically to appear for interview along with their all original documents before the committee on 16-11-2017 at 9:00 am in the old Senate Hall, Administration Block, Main Campus, Gomal University, D.I.Khan and no separate call letter will be issued for interview. ❖ Registration from PVMC is mandatory. Dera Ismail Khan, Khyber Pakhtunkhwa.